Oh that Joker, what a laugh. Could DC be making an animated Super-Pets film? Alex Kurtzman teases Star Trek: Discovery’s take on a younger Spock. Get a look at some of the returning rangers for Power Rangers’ 25th anniversary episode. Plus, what’s to come on The 100's season finale, and the return of Fantasy Island. Spoilers now! 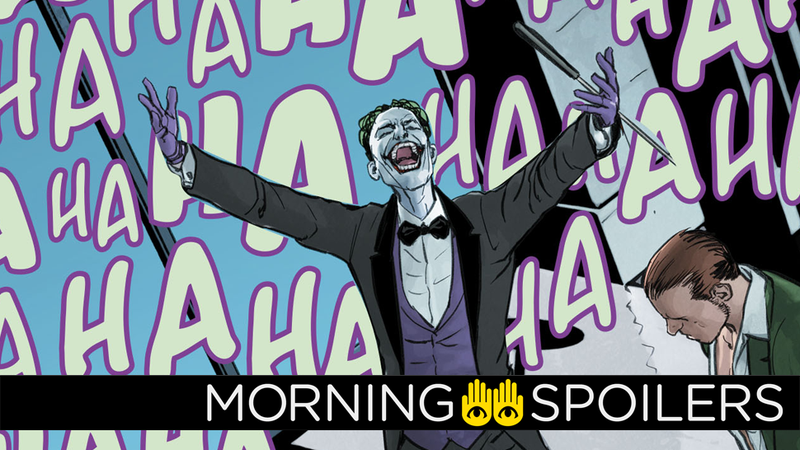 Variety reports GLOW’s Marc Maron is the latest actor to join the Joker origin movie. According to the site, Maron will play a booking agent on the comedy show hosted by Robert De Niro’s character, which will play host to the events that turn the Joker into the maddened clown villain we all know and...love? LEGO Batman writer Jared Stern will allegedly direct an animated film based on the pet characters of the DC Universe, according to Collider. Though no official team roster has been revealed, the property includes characters like Krypto the Super-Dog, Streaky the Super-Cat, Ace the Bat-Hound, Beppo the Super-Monkey and Comet the Super-Horse. Speaking with Collider, director Jon Turteltaub cited both the recession and a disinterest on Disney’s part for the cancellation of the National Treasure franchise. When National Treasure first got made, there was a lot more money to go around. Everybody got paid nicely. The problem with getting the third one made isn’t the people who are getting paid saying, ‘I’m not doing it unless you pay me a lot!’ It’s really that Disney feels they have other films they want to make that they think will make them more money. “I think they’re wrong. I think they’re right about the movies they’re making; they’re obviously doing a really good job at making great films. I just think this would be one of them, and they don’t quite realize how much the Internet is begging for a third National Treasure. The film’s official Twitter has neat new motion poster, transitioning between comic art and weirdly glowy publicity pictures. Speaking of Aquaman, the Justice League head to Atlantis in a new clip from LEGO Aquaman. Deadline reports Jolene Purdy (Orange is the New Black) has been cast a maenad named Shoshana. That Hashtag Show reports The Flash is now casting Caitlin’s father, Dr. Thomas Snow. Described as a Caucasian male in his 50’s, Dr. Snow is an extremely intelligent geneticist who has been MIA for a few decades. As he returns to Central City, Dr. Snow will do his best to make up for lost time with his daughter Caitlin and his wife Carla. But what they don’t know about Thomas is that he is keeping a big and mysterious secret. This is not entirely the Spock who has been formed enough to be the Spock that we know from TOS. There’s a lot of story about who Spock was before he becomes the Spock that is the yin-yang to Kirk. What I’m so excited about is that we have an opportunity to present a version of Spock that’s both totally consistent with the Spock everyone knows but very, very different. And it’s all gonna tie to how we sync up with canon. Episode three of the next season is titled “Dancing Queen,” according to Keto Shimizu on Twitter. IGN has an exclusive photo from the 25th anniversary episode of Power Rangers airing August 28th. The anniversary special sees the return of Catherine Sutherland as Katherine Hillard, the second Mighty Morphin’ Pink Ranger (among other teams), Jason Faunt as Wes Collins, Time Force Red, and Jason David Frank as Tommy Oliver, Mighty Morphin’s Green Ranger (and likewise a bunch of other teams in the franchise’s history). Spoiler TV has cryptic synopses for episodes five through 11. Netflix Vice President Cindy Holland once again confirmed there are “no plans at this time” for the second season of The Defenders.